Ukrainian President Petro Poroshenko has said he plans to restrict the rights of Russian citizens living in the country under temporary martial law following Russia’s seizure of three vessels off the coast of Crimea last weekend. Ukraine introduced martial law for 30 days in parts of the country on Monday, citing fears of a possible Russian invasion. Russian President Vladimir Putin accused Poroshenko of provoking the naval clash in the Kerch Strait to boost his flagging popularity ratings before elections scheduled for next March. 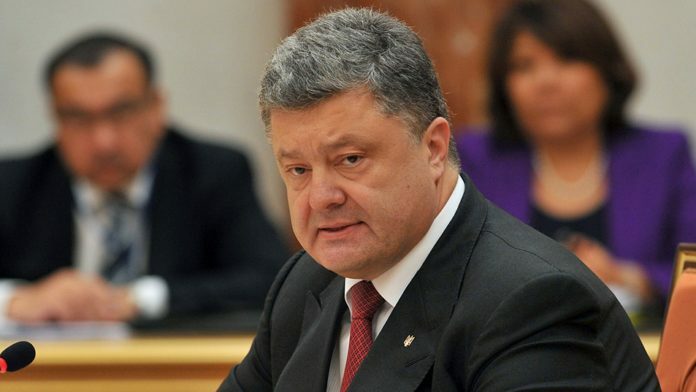 “No restrictions on the withdrawal of deposits, currency exchange transactions or travel abroad will be imposed on Ukrainian citizens,” President Poroshenko said in remarks published on his Twitter feed. “These restrictions will be imposed on Russian citizens, and I think it’s totally justified,” he said. The announcement coincides with reports from the Belarussian border that scores of Russian citizens had been denied entry to Ukraine for unspecified reasons since the Kerch Strait standoff broke out on Sunday. The Associated Press cited a Belarusian border guards spokesman as saying Tuesday that 52 people had been denied entrance to Ukraine upon arrival after traveling on a Belarusian airline and were put on a plane back. Russia and Ukraine closed their airspace to each other’s airlines in 2015, ending direct flights between the two countries and making Minsk a transit hub. Russia seized three Ukrainian naval vessels and their crews on Sunday over what it said was their illegal entry into Russian waters, which Ukraine denies. Twenty-four captured sailors have been ordered jailed for two months by a court in annexed Crimea this week pending a possible trial. All of the sailors face jail terms of up to six years if found guilty of what Moscow says was a plot to illegally cross the Russian border. Poroshenko earlier accused Russia’s President Vladimir Putin of wanting to annex all of Ukraine and called for NATO to deploy warships to a sea shared by the two nations. The naval clash raised fears in the West of a wider conflict between Russia and Ukraine.